When I was not troubled with health issues, Tuesday was my usual baking day. I would make sourdough angel biscuits to put into the refrigerator for the week, and bake bread, and maybe even some other sweet baked goods. I like to bake bread and biscuits and things like that, but don't particularly like to bake cookies and pies and cakes. It is fussy cooking, and I don't like to use the old measure and level off. It's just too much pressure! Well, I am trying to get back in the groove. There have been so many health setbacks, one right after the other, that I am having trouble getting traction again. I have had to swallow my pride, and just work on adding one thing at a time to what I can accomplish in a day. Thank God for my son Joel, I couldn't still work and be active in all the things we do if he wasn't there helping me. Anyway, I have added baking day back to my schedule this week. It almost did me in to knead all that bread dough, but I did it! My arms feel like noodles! 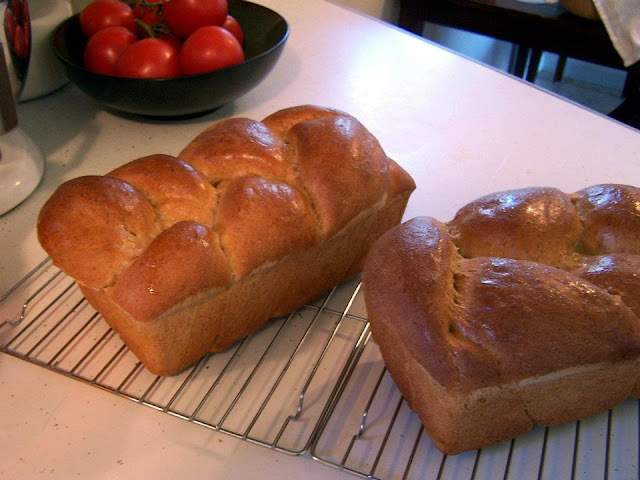 I just perfected this wheat bread recipe, and it is so simple it will be my new standard. The bread has wheat germ and two kinds of whole wheat in it, but the texture is very light, and soft. The recipe makes three loaves, but I held out one third of the dough and rolled it out to make garlic twists to go with our lunch today. The bread is a buttermilk bread. I pulled three cartons of buttermilk out of my fridge, and they were all expired. The oldest one was dated in May! I think cleaning the fridge day will be my next goal, because obviously I don't do a very good job of it. I did have some dried buttermilk in my pantry, but it was no good also! Did you know you can substitute regular milk and lemon juice for buttermilk? You just add 1 T lemon juice for each C of milk to sour it. You can also use vinegar, but I like the lemon juice better. dissolve yeast in water, and wait for it to bubble up, or proof. In a large mixing bowl, combine the proofed yeast, buttermilk, cream of tartar, salt, butter, agave nectar, wheat germ, and four cups of whole wheat flour. With a bread dough hook, knead the dough until the gluten forms long strings of batter. Gradually add in more flour and knead with the dough hook until all the whole wheat flour is incorporated. Turn out onto a floured surface, and knead in the remaining 3-4 cups of prairie gold flour. The dough should be very smooth and elastic, but still soft. Place in a well greased bowl, and cover with a damp towel and let rise for one hour in a warm place until the dough is double in size. Divide dough into thirds, and divide each third into three ropes of the same length. Pinch the ropes together at the top, and braid the dough: pinching the ends under and place in a greased bread pan to rise for 40-45 minutes. Take 1/3 of the dough above, and roll it out into a 12 inch by 10 inch rectangle. Brush with 1/2 stick melted butter to which you have added 1 heaping T minced garlic, 2 tsp minced basil, and 1 tsp Mrs. Dash garlic and herb seasoning, and a generous sprinkling of parmesan cheese. Fold the dough over in thirds, and seal the edge. Cut crosswise into 24 strips. Twist each strip twice and pinch ends to seal. Place on a baking sheet and cover with a damp towel and allow the dough to rise for 30 minutes. Bake in a 375*F preheated oven until twists are golden brown. Cool on a wire rack.